This is what a typical Taipei alley looks like- long and narrow, lined with pedestrians and parked motorcycles, with an array of endless colorful storefront signs in Chinese characters for hotpot, noodles, tea shops or cafes. This is NOT a typical sight in Taipei- an English only sign for Mexican food, the newly opened Juanita Burritos and Tacos, in an alley not too far behind old Sogo on Zhongxiao East Road. 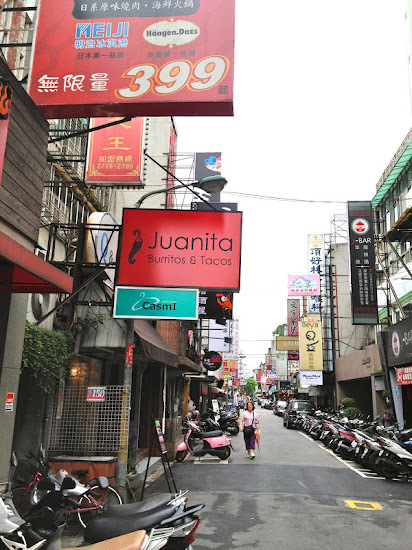 The name is an interesting choice as I can't even imagine how Taiwanese people will butcher the name, trying to pronounciate "Juanita," not to mention that the J sounds different in Spanish than it does in English, as do double LLs like in "tortilla." (I had a co-worker tell me recently that the name Heather was too hard to say, but that's a story for another day). But the name is memorable and stands out. The warm wood paneling storefront is an unusual, but welcome sight for me and for other burrito lovers in Taipei, as I am happy to see more and more entrepreneurs try to make finding good Mexican food in Taipei a reality after it being so many years an impossible dream. It's definitely interesting seeing more burrito places like Juanita open up this past year, as well as Barrito at ATT4Fun. Juanita's kitchen and counter takes up most of the shop, with some seating in the front and back. It's a tad roomier than Macho Tacos, seating about 20 people or so. I admit that I was quite surprised to see only English on all the red and white signs above the counter. Perhaps they expect customers who step foot inside to already be interested and kind of know what they are getting into. Anyone who has been to US fast casual chain Chipotle will definitely be drawing comparisons, since Juanita has pretty much ripped a page (or the whole book) from their menu. You start by ordering choosing a meat (or vegetarian), then what form you want it in (burrito, fajita burrito, burrito bowl, salad or tacos) and then your toppings/salsas which are all in view behind the glass counter. Prices are competitive, ranging from NT$150-170. There's no nachos or quesadillas (which are two of the most popular things my local friends usually order), but I'm curious about the fajita burrito. There's a choice of pinto or black beans, only one choice of cilantro lime rice and a range of salsas including roasted chile corn as well as fresh Haas avocado guacamole. I also liked that the option to add in cheese was free. Horchata, frozen margaritas and beers are also available, along with soft drinks. I ordered guacamole on the side (NT$30) for my barbacoa beef burrito, as well as the free side of chips we were given for the soft opening period. 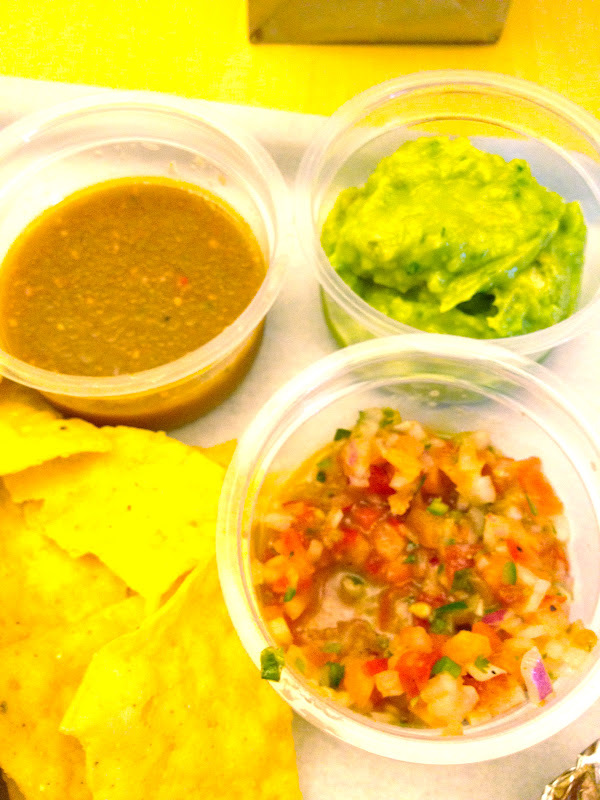 Without specifically asking for it on the side, I was also given some pico de gallo and tomatillo green chili salsa, both fresh and flavorful. Just the sight of the right colors and the right textures of the sauces was a great sign and integral part of the meal. Fresh green guacamole not made with Taiwan avocados!! The burrito was a decent size, though some might might think too small or not enough meat if comparing to the heartier sizes in the states. I would have appreciated more meat though I was adequately full (and satisfied) afterwards and enjoying my chips with the guac and salsas. Juanita actually reminded me of when Taipei counter burrito pioneer Oola first opened, before the owners parted and it went downhill (and transformed from Taipei's first Chipotle clone into some weird nightclub/mexican + burgers/pizza place). 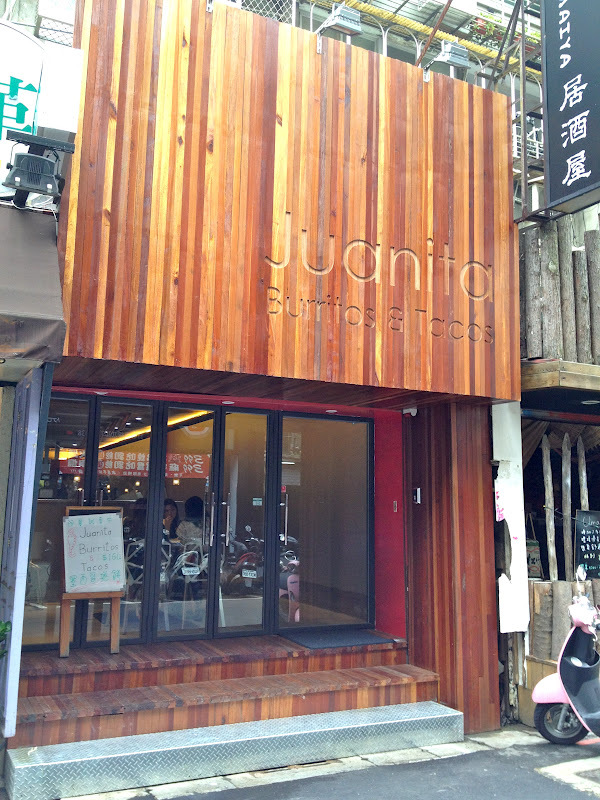 Reader Diane was the first to message me, saying Juanita did a good job being "Chipotle in Taipei." Most Taiwanese people (and some non-American expats) have probably have never heard of Chipotle, let alone eaten there. But I know a number of you have been craving it. Who's tried it and what do you think? Where is your favorite Mexican spot in Taipei, or are you still waiting? Thank you for this post. I have been dying, dying for a Chipotle-esque place to finally open in Taipei. Can't wait to check it out! I went there last week, and they are doing a good job adapting the US-based Chipotle experience to Taipei. I also had the barbacoa beef burrito, but with guac in it, to go. And they gave me free chips and salsa as well -- I guess they stuck with your suggestion! And even after I got home a full 15 minutes later, the tortilla didn't sog through. Yay! I try to drive more these days, and parking in that area is just abysmal. 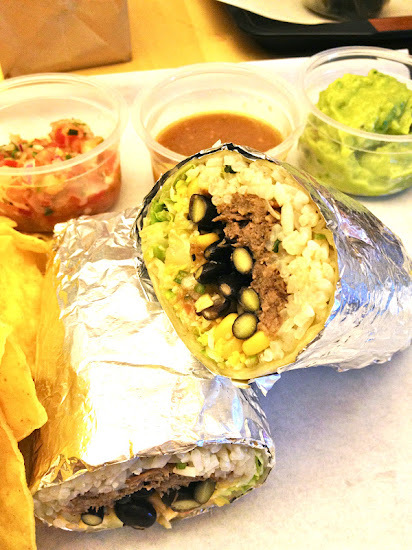 But if I have a craving for burritos, I'll likely hit Juanita up instead of Macho Tacos. Karen- thanks for commenting! tell me what you think when you try it out! Ben- thanks for commenting! I think the free chips was only in September.. I went back yesterday 10-8 and the chips were not free. Disappointingly I think the guac was also made from Taiwan avocados. While it was creamy it was slightly stringy and not sweet like Haas avocados are. I will have to remember to ask next time. Do they do 素 vegetarian (no onions or garlic)? If so that would be AWESOME. i'm a vegan myself but i absolutely loved Chipotle back in Cali. I have to say, they did a very very good job at keeping it authentic and not "fusion-y". chibear- haha! thanks for sharing your opinion! good to know what a chipotle fan thinks! I think it blows all the mexican places in Taipei outta the water, just cos they can cook their meats right. I'm SOOOO glad they're here. The only negative thing I'll say about it that they need to improve or tweak though, is their hot sauce. Overpoweringly spicy, but it shouldn't be a hard thing to make right. All the best to them!! visited on 10/1 and got free chips and salsa! It was my first time there so i wanted to get a burrito with a full order of chips and salsa. When they told me that chips werent ready (it was almost 2pm), i started with the burrito. Half way through the burrito I was about to get up and check about the chips when they brought it to me...on the house. It was a smallish order but exactly what you'd expect for being free. Overall still a step below real mexican joints in the bay area and chipotle but the best in taipei. A must visit! and we'll see if the chips are still free or it was just a 1 time deal. This place is amazing! Went twice in the past week. The meat is juicy and cooked perfectly. And guac that looks like guac! i absolutely hate cilantro, so it was really sad that my burrito today had to be wrapped without rice and salsa. i wish they could make cilantro-less sides for us non-cilantro eaters. too sad to see, there is no people in the Restaurant industry with even a slight idea of what Mexican food is. I've been twice, happy both times. The last time I went I carried out a burrito to go. They were very accomodating and packed my lettuce separately. I will be going back this week to get another one to go. very nice food i can not wat it is a Mexican cuisine food so i think it is very testy. Stopped in based on this website. The place looks good, I had the steak and fajitas. The steak was real tough. I can’t really blame Juanita’s as all beef in Taiwan lately has been bad. I should have picked the pork or chicken, both of those looked good. The chicken appeared to be a soup, but was white meat. 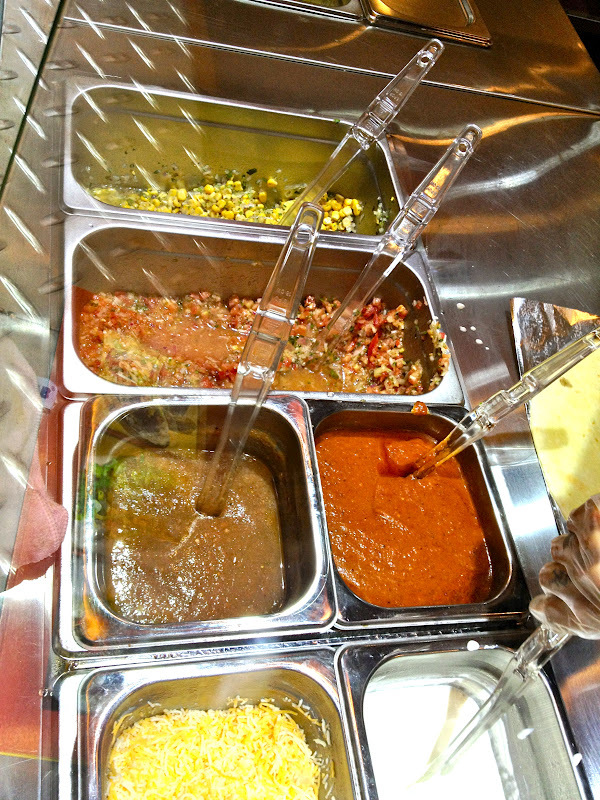 The sauces were excellent and yes they had cilantro and essential ingredient of Mexican food. Nothing was Taiwanesed-up. The staff seemed in training, but one person spoke English and knew how I was ordering. I went on a Sunday about opening time, probably not the best time, but to my surprise most of the seats where taken. The place is hard to find, my taxi just dropped me on Dunhua and pointed, I walked several blocks down the narrow street and found the place. Worth a try if you are in the area. I went there today! I got the chicken. It was maybe about two thirds the size of a Chipotle burrito but I found it far more bland. Also, the chicken was dry-ish. It was ok, but I don't think I'll go back. a bit sad that commenters are basing their tastes on mexican food by chipotle. COME ON. that's not mexican food. we need grilled tongue, cabeza, head, tripe, properly. -born in san francisco, schooled in san diego, lived in LA for 8 years. I come here often because of its convenient location. I also think their burritos are really good. I wish their tacos were like Dos Chinos but we can't have everything. Oh please, just look at the picture of the burritto. Looks like it was made by Soup Plantation! So bland and ...too neat for a real mexican dish! Taiwan has no mexican food. Get real people! Do they only have flour tortillas? I want corn tortilla tacos with hard shells! Is Macho Taco the only place with uses corn tortilla shells? @unknown- thanks for sharing.. I haven't been in a long time but that definitely doesn't sound like a good sign..